This triple height chapel has been carved from the lower floors of a banal office block on Peter Street in Manchester. The large room or volume is surrounded by circulation space, through which shines natural light. The long light from the west shines directly into the chapel in the evening. At ground floor level, at the front of the building, the designers have manipulated the barely double height space to accommodate a reception and bookshop with a tiny reading room. James Robertson, a Ph.D student at the Manchester School of Architecture, has been awarded a Rome Scholarship in Architecture at the British School at Rome for the 2008-09 academic year. James will be continuing his research intended to illuminate and challenge the received wisdom about the Glasgow architect Jack Coia and the ecclesiastical work of his practice Gillespie, Kidd and Coia. James’s period in Italy will allow him to cover three particular aspects of his study in detail, namely the influence of Coia’s Italian heritage and his travels there from the 1920s onwards, the relationship between his Scottish Catholic clients and the liturgical changes promoted by the Vatican in the mid-twentieth century, and the relationship between architecture and contemporary artists between the 1920s and the 1960s. James’s studies are supervised by Eamonn Canniffe and Dr. Bill Brogden (Aberdeen University). A virtual tour of the British School at Rome is available HERE. Good design has more than one reason. Following our recent items about Robin Hood Gardens, a link to a great collection of pictures of Park Hill, Sheffield (1961, Architects: Jack Lynn and Ivor Smith). CLICK HERE. The pictures include images of the proposed refurbishment. See also this description of the scheme and facade treatment and some strategic/financial stuff. The church at Bow is a collection of assorted elements gathered together in one building. It is modestly gothic (1878) with a cylindrical three-storey bell tower, very large pointed windows and clerestory lights, and an open nave. The ceiling over the chancel is highly decorated, the gold ribs run into the cast-iron columns, which are positioned centrally in front of pilasters between the windows within the white painted walls. It appears that the brick walls of the nave were once also painted white, but these have been allowed to peel and fade. The pews are placed around the raised altar and the organ is positioned against a blocked-up arch. Into this mixture Matthew Lloyd Architects have inserted a two-storey steel and timber structure. It is raised high into the vaulted ceiling of the church to leave the chancel and the nave free for worship. The front of this bold curved wooden structure is supported by four enormous white painted Y-shaped steel columns, which just stand among the pews. The rear is connected to a white rectangular box of a quite different nature, and contained within this is the meeting room and stairs to the gallery, gym, and community rooms at first and second levels. The building has been split three-dimensionally into two L-shaped sections. 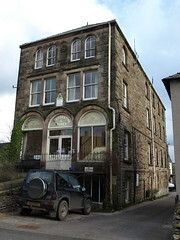 The church occupies the L at the front and ground level and the community use the L at the top and back of the building. The language of the new is quite different to that of the old, but then, each area is an assemblage of different styles, components and functions, the solution of which seems to work. Things are exactly as they appear and behind them there is nothing. Following the post by Aventinus below more writers express their scepticism about the qualities of the Smithsons’ Robin Hood Gardens: Part iv and Fantastic Journal and Neighbourhoods. Building Design are pushing 1000 names. Were you emboldened? This short film documents a study of the mediation between urban and interior space, historic fabric and the contemporary city. This research through design was produced by Year 5 students in Continuity in Architecture, and was intended to remember, to reveal and to construct. Adjacent to Piazza Duomo, the locus of the exploration, the fourteen bays of the loggia of the Broletto, presents an ambiguous but potent site. Raised from street level, but open to the public realm, it is a civic memorial to the dead of the resistance as well as a survival of Milan’s medieval commerce. In a heavily constrained response to this context, the students created a new narrative for the site, using their theoretical narrative for an interpretative project within the protected urban environment of central Milan. They proposed ephemeral structures to embody their speculative positions, and judged how their intervention will lead to a new reading of the historic civic realm. Each student specified the issue for which they designed a temporary pavilion, including spaces and surfaces for storage and display, for the dissemination of information and advertising, but above all for the re – reading of the city. This one is different, it has nostrils. 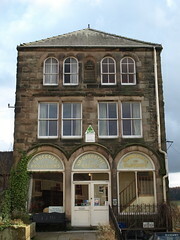 Former Co-op building on the main street of Youlgrave, Derbyshire. 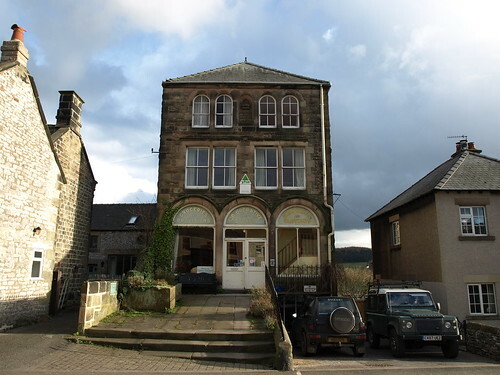 Now the Youth Hostel. Save Robin Hood Gardens? You must be joking! Is the architectural profession really so flush with time and ennui that it has nothing more significant to work itself up into a lather about than indulging in nostalgic support for a failed urban idea and some of its more misery-inducing spawn? What credibility can there be in a publication such as Building Design which heaps attention on the (Woodrow) Wilsonian neo-gothic temporary university home for the privileged AND the (Harold) Wilsonian concrete deck-access permanent housing for the underprivileged in the same 29 February issue? It has long been my suspicion that the more self-regarding post-war British housing schemes were really a form of class war by other means conducted by the ideologically blinkered, and BD’s current campaign to ‘save’ Robin Hood Gardens has only served to confirm the detachment from reality which has long been the hallmark of the architectural press. Posted on March 4, 2008 March 13, 2008 Author AventinusCategories Aventinus, Buildings at Risk, CiATags bd, cia, classwar, robinhoodgardens, save robin hood gardens, smithsons12 Comments on Save Robin Hood Gardens? You must be joking! Reversing Corb’s maxim that buildings should imitate cars this 4.3 litre V2 GN Racer from 1910 uses a nice domestic brass light switch for its ignition. Capable of 80 m.p.h this terrifying car has no seat belts and no roll bar but does come with wipe clean aluminium seats and a handy doctor’s bag.